ArtsEmerson: The World On Stage will present SITI Company’s production of "Trojan Women" from April 17 - 21 at The Paramount Center Mainstage, 559 Washington Street in Boston’s Theatre District. Among the greatest of all anti-war dramas, "Trojan Women" meditates on the moments of individual choice that separate death and life, despair and hope, future and past. In the ruins of their burning city, the royal women of Troy -- still mourning the slaughter of their husbands and sons -- await enslavement and exile. 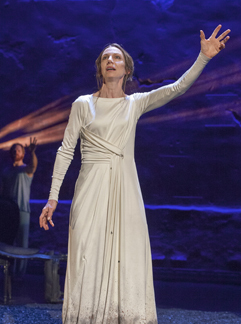 In this contemporary adaptation by Jocelyn Clarke, characters such as Odysseus (formerly seen but not heard) appear, and live original music underscores the timeless tale. Acclaimed director Anne Bogart and her SITI Company return to ArtsEmerson after last spring’s "Café Variations" with this vital production of Euripides’ classic. SITI Company's production of Trojan Women was commissioned by the J. Paul Getty Museum and first presented at the Getty Villa in Los Angeles, California, in September, 2011. SITI Company is an ensemble-based theatre, founded by Anne Bogart and Japanese theatre artist Tadashi Suzuki. SITI has received American Theatre Wing, Elliot Norton and Obie Awards, among others. Bogart is a 2012 Doris Duke artist and the recipient of two Obie Awards and a Bessie Award, as well as Guggenheim and Rockefeller Fellowships. Bogart also runs the Graduate Directing Program at Columbia University.